Described as ‘unquestionably the finest opera of the late Victorian period’, Jeanie Deans was first performed in 1894 and has most recently been revived in 1986 and 1994, on each occasion being highly praised. This is the first recording of any part of it at all. The BBC Scottish Symphony Orchestra under Martyn Brabbins are joined by distinguished soloists including Lisa Milne and Janice Watson. 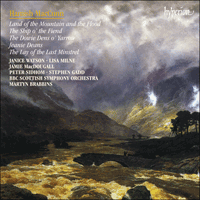 Hamish MacCunn: the name itself is a kind of bold statement, and if ever there was a composer who emerged from the glens and firths of Scotland, fully armed, the MacCunn was that person. Yet this is the first recording devoted solely to his work and, with the exception of Land of the Mountain and the Flood, the first of any of his orchestral music. Hamish MacCunn: le nom en lui-même est déjà une référence. Et s’il y avait un compositeur qui émergeât des vallées et des rivières d’Écosse en pleine possession de son talent musical c’est bien MacCunn. Il s’agit pourtant ici du premier enregistrement entièrement consacré à son œuvre et, exception faite de Land of the Mountain and the Flood, du premier enregistrement de sa musique pour orchestre. Hamish MacCunn: Schon der Name sagt einiges aus, und wenn es je einen Komponisten gab, der mit allem gewappnet aus den schottischen Tälern und Förden hervorging, so war es kein anderer als MacCunn. Dennoch ist dies die erste Aufnahme, die sich ausschließlich seinem Werk widmet und, mit der Ausnahme von Land of the Mountain and the Flood, die erste Aufnahme seiner Orchestermusik überhaupt.